Our TICA 2016-2017 show season! Our TICA 2015-2016 show season! Our TICA 2014-2015 show season! Cuzzoe, Moro, Parti Wai, and Versus catteries are proud to announce our National and Regional Winners for the CFA 2013-2014 show season. Congratulations to another Cuzzoe Grand! Special thanks to Elaine Magee for all your help! 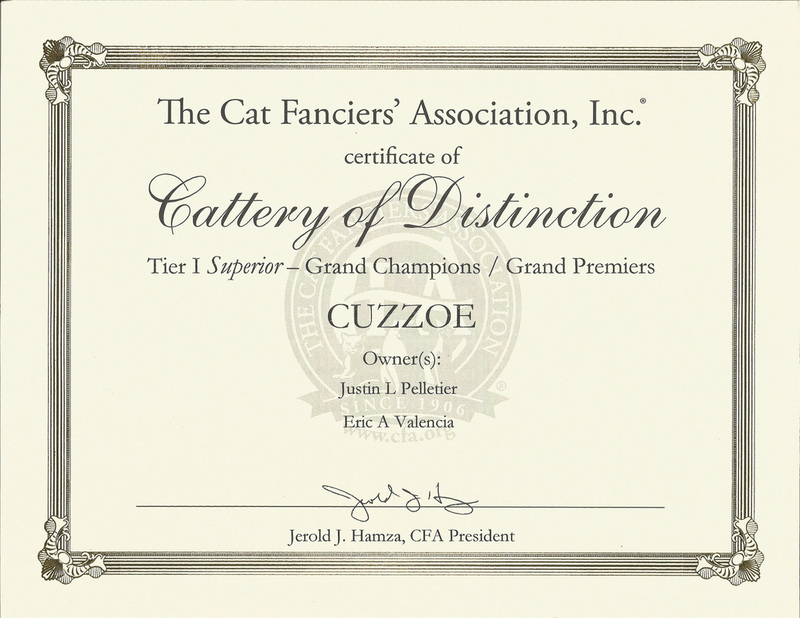 Cuzzoe and Moro catteries are proud to announce our National Winner for the CFA 2012-2013 show season. Our first Cuzzoe Distinguished Merit! Cuzzoe, Moro, Haendel, and Tropikoons catteries are proud to announce our National and Regional Winners for the CFA 2011-2012 show season. One Show...2 One Show Grand Champions! March 8, 2012 at the Crab and Mallet show in Baltimore, MD. We are happy to introduce you to our 1 National Winner, 2 Regional Winners, 2 Divisional Winners, and 3 Breed Winners for the CFA 2010-2011 show season. The CFA 2009-2010 show season is over. We are so very pleased to announce 2 new National Winners and 1 Divisional Winner. Chiquita is a 1 show Grand! 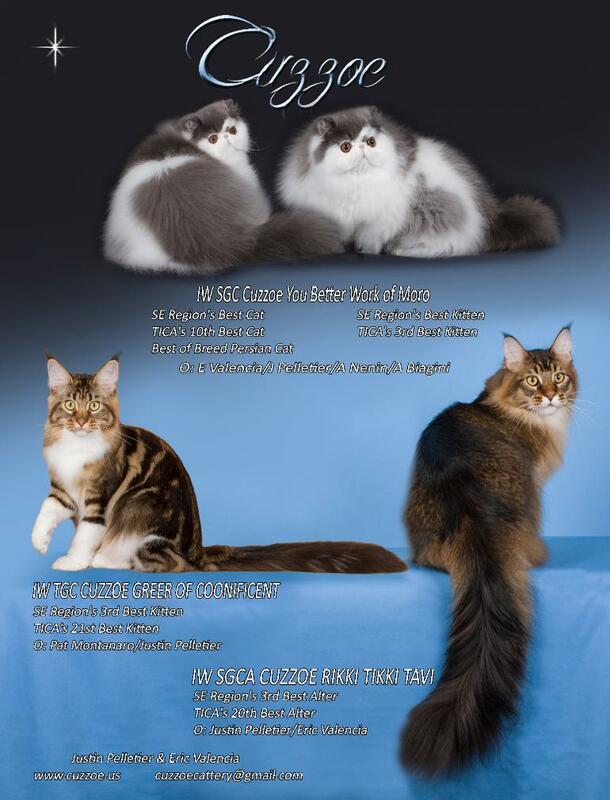 March 6, 2010 CH Kuorii Chiquita of Cuzzoe became a CFA Grand Champion in only 1 show at the Cat Club of the Palm Beaches show! Cuzzoe Go Diego Go officially became a Haendel's Bandit! We all traveled to Belgium to meet his new co-owners, Doerte & Martin Haendel of Germany. We had a wonderful St. Valentine's weekend together, and we are all very proud to say Diego was Highest Scoring Kitten In Show!! 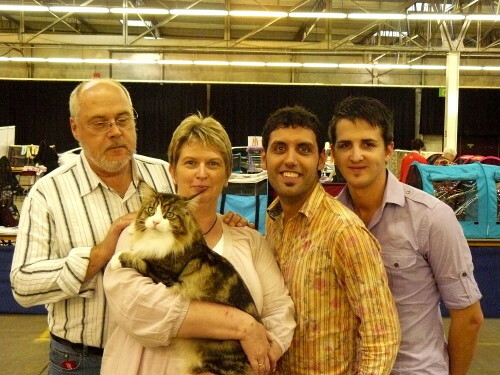 He was the only kitten to make all 8 AB finals, scoring BEST, BEST, BEST, BEST, 2nd, 4th, 5th, and 6th. What a great start to his European show career! GO DIEGO GO!! Gorilla is a Grand Champion! 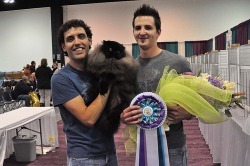 December 5, 2009 CH Kuorii Gorilla of Cuzzoe became CFA's newest GC's at the Greater Baltimore Cat Club show! Kuorii Gorilla of Cuzzoe Makes CFA History! Kuorii Gorilla of Cuzzoe, competing as an Open at 8 months of age, wins Best LH Cat in Championship and goes on to win Best Of The Best! This is the first time in CFA's history that an Open, the entry level of competition for an adult cat, has ever won Best In Show at an International Cat Show! years. Gorilla follows in the footsteps of last year's winner, our own GC, BW, NW Kuorii Santos of Cuzzoe! We are also very proud of our new little girl, Kuorii Chiquita of Cuzzoe. At 5 months of age, she won Best LH Kitten at the International show! She was 1 of 6 cats, along side Gorilla, that were eligible to compete for Best Of The Best.